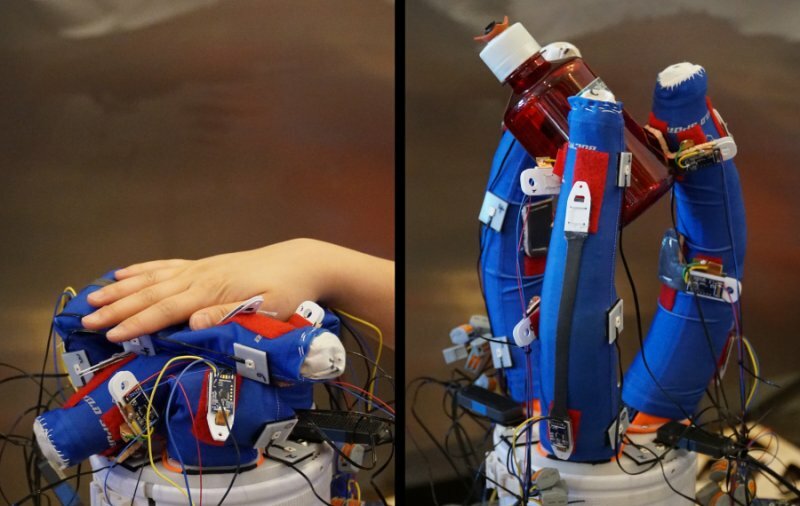 Soft robotic grippers can grasp objects of many different shapes while tolerating misalignments. However, many current soft systems lack proprioception and the ability to sense the position and orientation of the object to be grasped. Understanding the configuration of a gripper's fingers and the contact forces on a grasped object is crucial for manipulating an object and for interacting with the external environment. In this work, we instrument a fabric-based pneumatic gripper with strain and pressure (force) sensors. Using sensors affixed to removable sleeves fit over each gripper finger, we identify the finger position and contact force on a grasped object. We show that we are able to completely deflate and pack the gripper, and then deploy the gripper and sensors to full operation. Finally, we demonstrate closed-loop control of the gripper configuration using the strain sensors to reconstruct pose. The sensorized gripper deploys from a packed state (a) and grasps an object (b). Silicone-based capacitive strain and pressure sensors are used to instrument a fabric-based pneumatic gripper. The sensors enable state estimation, grasp feedback, and closed-loop position control. The system&rsquo;s intrinsic deformability allows it to be deflated, packed down, and then deployed to full functionality.